Melanin pigments are multifunctional polymers ubiquitous in Nature produced by all biological kingdoms, including bacteria, fungi, plants, helminthes, and animals (reviewed in Nosanchuk & Casadevall, 2006). They are amorphous, negatively charged, hydrophobic pigments of high molecular weight, insoluble in aqueous and organic solvents, resistant to concentrated acid, susceptible to bleaching by oxidizing agents and not amenable to either solution or crystallographic structural studies and, consequently, a definitive chemical structure by conventional biochemical and biophysical techniques is a difficult project to pursue (Hamilton & Gomez, 2002; Nosanchuk & Casadevall, 2006). Melanins are composed of polymerized phenolic and/or indolic compounds, usually dark brown or black, and consist of stable organic free radicals (Enochs et al., 1993). In mammals, melanin synthesis is catalyzed by tyrosinase (Sanchez-Ferrer et al., 1995) while microbes generally synthesize melanin via various phenoloxidases such as tyrosinases, laccases, or catacholases and/or by the polyketide synthase pathway (reviewed in Wheeler and Bell, 1988). Many diverse functions have been attributed to melanins and have been associated with virulence in a variety of pathogenic microbes. Melanin has been associated with virulence also in P. brasiliensis (Gomez et al., 2001). It is believed to contribute to microbial virulence by reducing the fungal pathogen susceptibility to killing by host antimicrobial mechanisms and by influencing the host immune response to infection. The authors recovered pigmented particles after chemical and enzymatic treatment of conidia and yeasts grown in vitro (on water agar and in the presence of l-DOPA, respectively). Melanin-like particles were also obtained from infected mouse tissue after chemical and enzymatic treatments. They were reactive with antibody to melanin and had yeast-like morphology. A laccase-like activity was detected in protein extracts providing strong evidence for the enzymatic synthesis of melanin in yeast cells. On the other hand, evidence for in vitro conidial melanization is even stronger since conidia become pigmented when suspended in water, indicating a capacity to synthesize melanin in the absence of l-DOPA (Gomez et al., 2001). 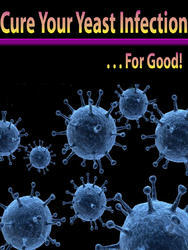 The ability of melanin to protect microbes from host defenses is relevant to antimicrobial therapy because the clinical efficacy of some antimicrobial drugs has to be complemented by host immune defenses (Nosanchuk & Casadevall, 2006). Melanized P. brasiliensis yeast cells showed increased resistance to phagocytosis. 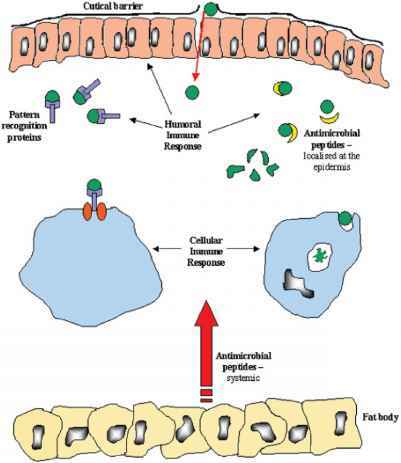 Since melanins are charged polymers their presence in the cell wall can alter the fungal cell surface charge as in C. neoformans (Nosanchuk & Casadevall, 1997) and thus may contribute to inhibition of phagocytosis. In addition to reducing ingestion, melanization protects P. brasiliensis against killing by macrophages (Silva et al., 2006). In fact, melanization protects P. brasiliensis against injury mediated by nitrogen- and oxygen-derived free radicals and enhances protection against H2O2 and hypochlorite similarly to C. neoformans, Aspergillus spp., S. schenckii (reviewed in Nosanchuk & Casadevall, 2003). Melanins are highly effective scavengers of free radicals (Sichel et al., 1991). Electron transfer from free radical species generated in solution to C. neoformans melanin has been demonstrated by electron spin resonance spectroscopy (Wang et al., 1996). Similar spectra were generated with melanins from P. brasiliensis, H. capsulatum, S. schenckii, and Pneumocystis spp. (Nosanchuk & Casadevall, 2003). Melanin is an antifungal resistance factor, given its ability to reduce the susceptibility of melanized cells to antifungal drugs (Ikeda et al., 2003). Melanization of P. brasiliensis yeast cells (Figure 11.4) did not affect the cytotoxicity of amphotericin B, ketoconazole, fluconazole, itraconazole, sulfamethoxazole as measured by the standard broth macrodilution procedures for assessing the susceptibility of yeast cells to antifungal drugs (Silva et al, 2006). Similar results have previously been observed with melanized in comparison with nonmelanized C. neoformans and H. capsulatum (Van Duin et al., 2002). By using a killing assay, however, the increased resistance of P. brasiliensis melanized cells to amphotericin B was observed. This effect was less pronounced with the azoles (Silva et al, 2006). The killing assay with melanized C. neoformans and H. capsulatum also showed less susceptibility to amphotericin B and caspofungin, but melanization did not affect cell resistance to fluconazole and itraconazole (Van Duin et al., 2002). 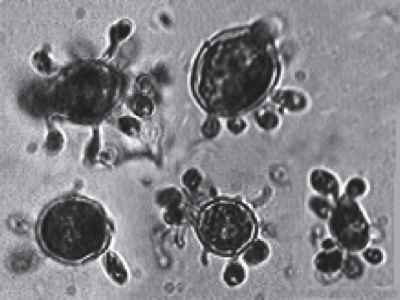 Laccase is an important virulence factor in several fungal infections. Laccase production in P. brasiliensis has been described by Gomez et al. (2001) and Silva et al. (2006) by two different methods. Laccase in C. neoformans has been associated with virulence through melanin synthesis, iron uptake, interference with oxidative burst, and a role in extrapulmonary dissemination. The enzyme was found in the cytoplasm, cell wall and capsule of fungal cells grown in vivo (Garcia-Rivera et al., 2005). Further studies are necessary to define the role of laccase as a virulent factor in P. brasiliensis.